I have no idea what to get my cats for Christmas. Do you have any suggestions? I'm so glad you asked! I love to help humans with their Christmas shopping for cats! Here's our list for this year. I hope it gives you some ideas. 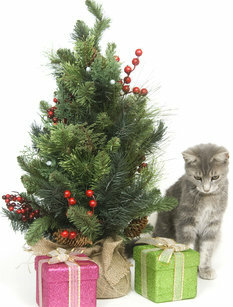 Oh, and happy holidays to you and your cats! Exercise wheel for cats : We're getting this for Sizzle because he needs to lose some weight. Our human's thinking he'll burn up calories while he's running around the wheel. Honestly, I can't see Sizzle running around anything unless it involves food. But Boots will have fun with it. NoBowl Feeding System: This sounds like fun. Little plastic bowls for dry food fit inside the fabric mouse. When we play with the mice (we're getting a few), all the food will fall out, and we'll get to eat it off the floor. It's sort of like hunting, but we'll be hunting indoors where it's warm instead of outside in the freeezing cold. 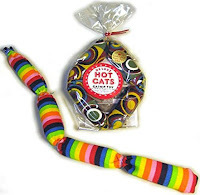 Hot Cats : These are our all-time favorite toys, and we get new ones every Christmas. The Deluxe Hot Cats like this one are 17 inches long! They're made in the US of denim twill and are stuffed with 1 1/2 cups of high-octane, organically grown catnip. I can't even begin to tell you how much we love these things! 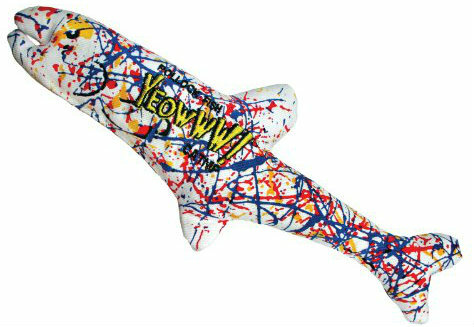 Yeowww Catnip Pollock Fish : We love Yeowww Catnip toys, too. The bananas are fun, but the fish are our favorites. They're 11 inches long and stuffed to the gills with really potent organic catnip. They're so much fun! It's nice that they're made in the US, too. Turbo Scratcher : This is a must-have for every cat. We already have several, so we probably won't be getting more this year. We love to chase the ball around the turbo track and scratch the cardboard middle and then nap on it. My human typist asked me to pass these shopping tips along to you. She says you'll find the best cat toys online on Amazon and eBay. 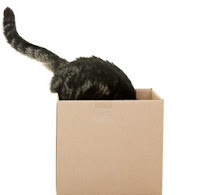 The big pet supply chain stores usually have toys that are boring and get lost in a corner after a couple of minutes. Look for toys that are safe -- our play mice don't need sewn-on eyes or bells -- and are well-made so they'll last and be fun for years. We've had some of our Hot Cats since we were kittens! Also make sure the toys fit the cat. Many toys, especially the ones you put on the floor for the cat to play with alone, are designed for kittens, not adult cats. Oops! Gotta go now. The UPS driver just left a box outside our door. To be honest, we think the boxes our toys come in are the most fun of all. So if you shop online, be sure to save yours and the packing paper inside for your cats! Good point about the size. I never thought of that. There's nothing more frustrating than trying to play with a toy that's teeny tiny! Thanks for your comment, and happy holidays!